This piece contains uvite tourmaline with minor flecks of sapphire (blue gem var. 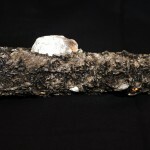 corundum) on a gleaming matrix of pearly, greenish muscovite. Uvite occurs in beautiful green and reddish-brown crystals. It is an uncommon, calcium-magnesium-rich member of the tourmaline group of complex aluminum borosilicates, crystallizes in the hexagonal (trigonal) system as stubby prisms. It has a generally greenish-black color and occurs in metamorphic and skarn-type environments. 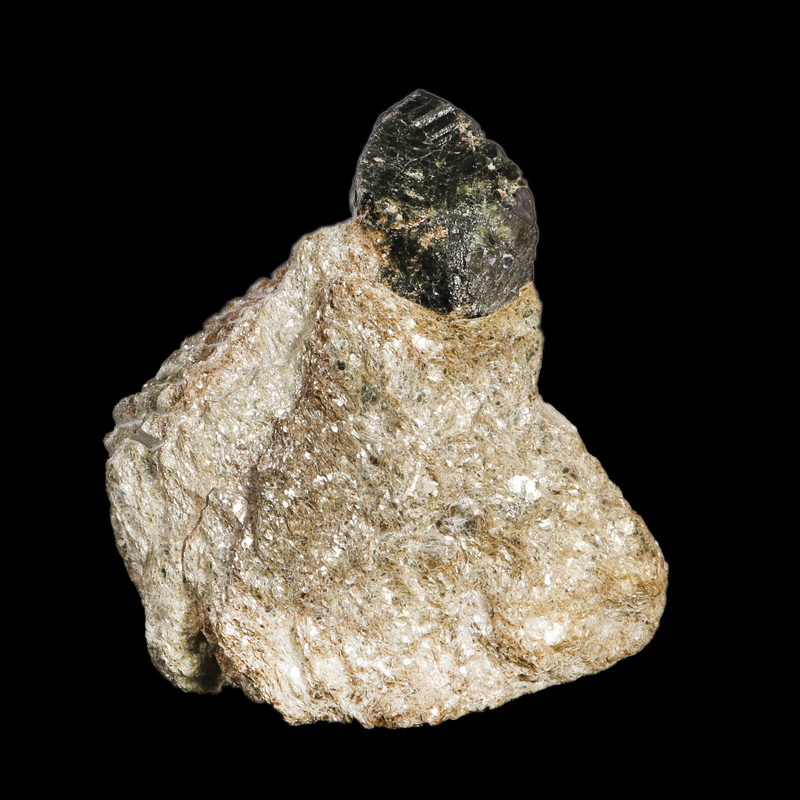 HISTORY, NAME, LOCALITIES: Uvite, pronounced YOU-vite, was recognized as a mineral species in 1929 and named for its discovery location in Uva Province in Sri Lanka (formerly Ceylon). Uvite is collected in Brazil, Pakistan, Madagascar, Namibia, Sri Lanka, Myanmar, Canada, Mexico, and the United States (New York, Arkansas, Colorado, New Hampshire). 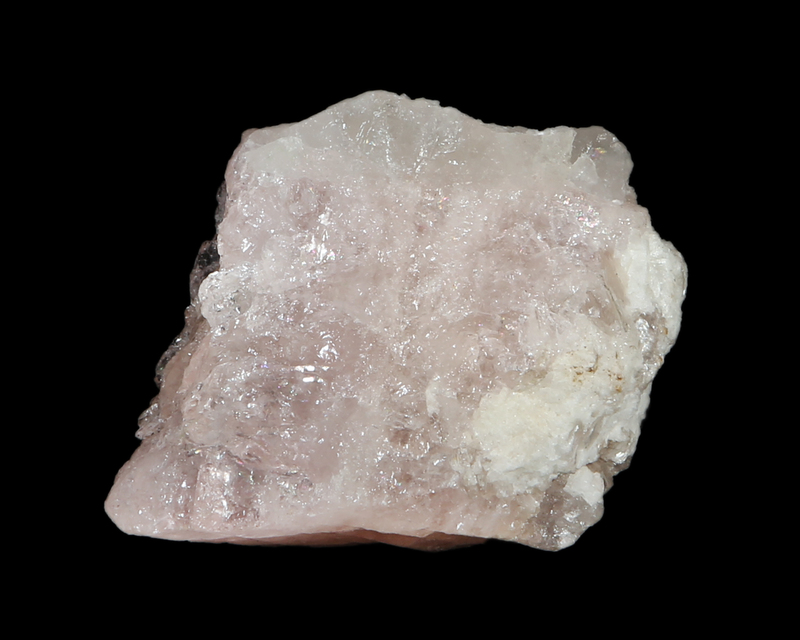 MINERALOGY, PROPERTIES, OCCURRENCE: Uvite [basic calcium magnesium aluminum oxyborosilicate, CaMg3Al6(BO3)3(Si6O18)(OH)3O] is an uncommon, calcium-magnesium-rich member of the tourmaline group and crystallizes in the hexagonal system (trigonal subsystem) as stubby, striated prisms with hexagonal cross sections. It is transparent to nearly opaque, has a vitreous luster, lengthwise striations, and is usually black, greenish-black, brownish-black, or dark green. 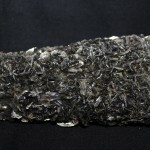 It has a substantial Mohs hardness of 7.0-7.5, no cleavage, and a specific gravity of 2.9-3.2. Uvite occurs primarily in calcium- and boron-rich, metamorphic and skarn-type environments. In 2011, mineralogists employed advanced quantitative-analytical methods to redefine uvite as two separate minerals that are end-members of a solid-solution series: Uvite now refers to the hydroxyl-dominant end-member, while fluor-uvite is the correct name for the fluorine-dominant end-member. METAPHYSICAL PROPERTIES, LORE, USES: Modern metaphysical practitioners believe that uvite diminishes fears and promotes self-confidence, awakens one from illusions, brings an awareness of reality, and enhances fortitude. Uvite has neither technological nor jewelry uses. 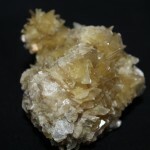 COLLECTORS’ INFORMATION: Uvite is collected because of its rarity and frequent association in attractive composite specimens with such minerals as quartz, muscovite, and apatite-(CaF). HISTORY, NAME, LOCALITIES: The sapphire variety of corundum has been collected since antiquity. The name “corundum,” pronounced coh-RUN-dum, stems from kuruvinda, the ancient Sanskrit word for “ruby”; the word “sapphire,” pronounced SAH-fire, comes from the Latin sapphirus, meaning “blue” and referring to the classic sapphire color. Sapphire is collected in Myanmar, Tanzania, Sri Lanka, Thailand, Cambodia, India, Malawi, and the United States (Montana). MINERALOGY, PROPERTIES, OCCURRENCE: Corundum [aluminum oxide, Al2O3] crystallizes in the hexagonal system as tapering or pyramidal prismatic crystals in rough and rounded barrel shapes, and as granular masses. It has a Mohs hardness of 9.0, no cleavage, and a specific gravity of 3.9-4.1. Corundum is transparent to translucent and occurs in all colors. The red gem variety is ruby; all other colors are sapphire. The classic blue color of sapphire is due to iron and titanium chromophores. Sapphire occurs in nepheline-syenite pegmatites, metamorphic rocks, and secondary alluvial deposits. METAPHYSICAL PROPERTIES, LORE, USES: Sapphire, one of the first precious gemstones ever mined, is the birthstone for September. Metaphysical practitioners believe that sapphire is a stone of wisdom and learning that enhances the ability to see underlying truths, helps to access deeper levels of consciousness, and promotes order, structure, and discipline. Non-gem-quality sapphire crystals were once fashioned into jewel bearings for fine watch movements. Transparent blue sapphire, one of the classic precious gemstones, is faceted into very costly gems; translucent star sapphire is fashioned into cabochons. COLLECTORS’ INFORMATION: Sapphire specimens are collected for their rarity, color, and interesting crystal habits. 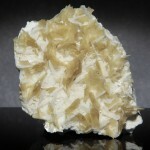 Muscovite on Albite 3 1/2" x 3"